This is the first installment of a new series at Villanova Running called These Five Things. The series will focus on Villanova's standout performers over the decades -- great runners at Villanova who helped create and solidify the glory of the Villanova program. Given that the Penn Relays have just concluded, with more great performances from Villanova athletes, we start the series with Mark Belger, an All-American runner and NCAA Champion who ran at Villanova from 1974-1978. Belger arrived at Villanova from Mepham high school in New York as one of the top US high school runners over 880 yards. No Villanova runner has won more Championship of America races at the Penn Relays -- 10 in all -- than Mark Belger. 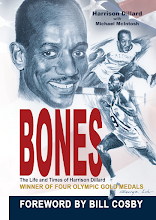 He never lost a race at the Penn Relays. He was twice (1977 and 1978) named the meet's most outstanding athlete. He was part of a relay world record as well: on February 7, 1976 Belger ran the opening 1200 meter leg of Villanova's world record Distance Medley Relay. Belger, Glenn Bogue, Phil "Tiny" Kane, and Eamonn Coghlan set the world record in the DMR that night, running 9:38.4 at the Mason-Dixon Games in Louisville, Kentucky. Lest you think that Belger was merely the beneficiary of Villanova's relay dominance at the Penn Relays at the time, individually Belger won two NCAA championships (1000i yards in 1976 and 880i yards in 1978), and was a 4-time NCAA finalist outdoors in the 800 meters (finishing 2nd in 1977 and 3rd in 1976). 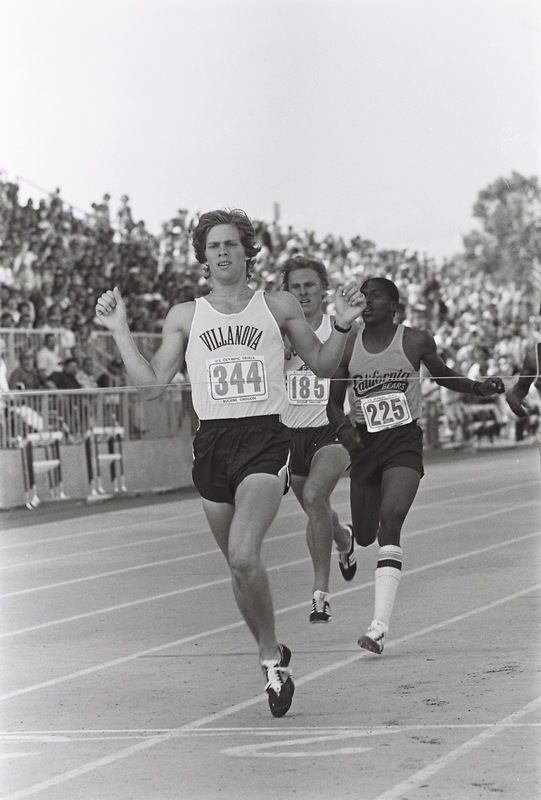 He left Villanova in 1978 as the school record holder over 800 meters with a 1:45.85 PR. His daughter Erin was also an NCAA 800 meter finalist for Cal-Berkeley in 2002, when she finished third in the NCAA final. She boasted a 2:04.39 collegiate PR. Belger finished in the dreaded 4th spot at the 1976 USA Olympic Trials at that distance in 1:46.36, a mere .08 seconds out of third.. During his post-collegiate professional career, Belger at one point or another beat every major 800 meter runner in the world -- except Olympic gold medalists Steve Ovett and John Walker. "When I think back on my times at Villanova, both as a student and an athlete, more and more my thoughts revolve around These Five Things: . . . . "
I grew up on Long Island on a dead end street; last house on the left. My block was a cornucopia of humble backgrounds. We had plumbers, teachers, volunteer fireman, city cops, gas station attendants, carpenters, engineers, retirees and housewives. My father was the self employed electrician, my mom a housewife and at one point a cafeteria lady at the local elementary school. We were German, Polish, Irish and Italians. We were Catholics, Protestants, and Jewish and as far a I knew we were the only home that didn't have a family phone or car -- those were for business use only. And like most adolescents, I wanted to break the mold and get out. Before my running career took off I thought the only way I was ever going to go to college was by joining the Army, and after a stint in Vietnam the government was going to pay my way through some sort of GI plan. With my running success things changed. I received more than a 100 recruitment letters from colleges and universities who were going to pay my way, room, board, tuition, everything. Some of them even offered special treatment (one saying they would Tartan the floors in my dorm hallways if I wanted to do strides there). Then came Jumbo. Mr. Elliot. He came to my home to visit with me and my parents. He was personable and positive. And instead of talking track and field he spent most of our time talking about the fact that graduating from a prestigious institution such as Villanova would make me, my parents, and Villanova proud. He spoke of character, the quality of education, and the success of the Alumni worldwide. And he mentioned that I would only be a few hours from home and could visit nearly anytime I wanted... which was true, all of it. I'm proud to be a Villanovan and my mom loved when I hitch hiked home every other month with a load of laundry and hungry for some of her home cooked meals. After going to class, training and racing were the backbone to my existence for those 1400-plus days I spent at Villanova. It was Jumbo who always said there were three things we could do while in college, but to succeed you could only chose two, and it was our choice to select wisely or suffer the consequences. The three choices were studying, sports, and socializing. So my life went as follows: Up at 7am, usually when the Crew team was coming back from their morning row on the Schuylkill River, a quick a walk through cafeteria breakfast, morning classes, a quick lunch, early afternoon classes, a one-or-two hour training session (either out on the roads or on the cinder track), then, finally, a sit down meal. During the winter months I liked to sleep in so I blew off the early class and took a night class instead. I learned most from my math and science professors but enjoyed religion, literature, and philosophy classes the most. My interests in statistics and calculus eventually got me to where I am today, but there was this socializing thing on certain nights that bugged me… it was call the “Cat’s Eye”-- the on campus bimonthly social event that required tickets to get in. Being broke and unable to obtain tickets before they sold out, I needed to find a way in, which is where my marketing classes stepped in. Product Placement (2 off the 4 P’s). The Cat’s Eye was always oversold, so a few hours after the party started, we would walk up to the door with a table and chairs and talk our way in saying the tables and chairs were needed to support the overcrowding and that they were needed most next to where the libations were being served… it never failed. Jumbo was the recruiter and Jack was the glue that kept us together. Sometimes I thing Jack was Jumbo’s greatest recruit. If it weren’t for Jack, Jumbo would have been successful, but maybe not as successful if it weren’t for Jack’s insight, love and knowledge of the sport. They each had a role in the team’s NCAA successes. When it came time for Jack to step back and let Jumbo take over, he did so invisibly. One time, after they strategized about who was going to be on which team at the Penn Relays, Jack stood quietly by letting Jumbo do the typical thing he did to pep us up. He’d smile a lot, squeeze your shoulders and say “How you feeling, How you feeling?” He kept smiling and squeezing… then everything would be fine and you would be ready race. For one of the Distance Medley teams I was on, he did this same routine to the quarter miler and half miler, then turned to walk away without saying a word to Eamonn or myself. We looked at each other, felt cheated, and stopped Jumbo saying something like “Mr. Elliot, what about us?” Jumbo looked at me, looked at Eamonn, looked back at me then turned to Eamonn and said “Eamonn, if Belger screws up you’re going to be so far behind you might actually have to run!” That day I ran a 2:48 ¾-mile leg and helped Eamonn win one of his nine Penn Relay watches, my10th. That Jack, he really new when to let Jumbo loose. Living on a beautiful campus with its own train station and chapel, talking with professors who cared, training with an amazing team of athletes, having access to an unlimited amount to food, what else could someone ask for? One day, while talking with the Assistant Dean of Men, he asked me just that. I mentioned I’d like to have a radio with an alarm to wake up to instead of my windup alarm clock. He offered me a job as a movie projectionist for the movie series we had on campus, which I graciously accepted. Not knowing what to expect I ‘borrowed’ the movie from the movie pool and a car and went back to Immaculata. The notice I had taped to the door was replaced with a note saying “Movie moved to Auditorium”… Great. It was dark, I was lost and wandering the campus hauling a movie projector and three rolls of movie tape looking for an auditorium. To make this short, the Student Body President who had changed the location of the movie, found me wandering, helped me set up and even collected the money. However, like most of the audience, she left crying before the movie finished. No worries, I can do this again I thought. The next day I was called to the Deans office and asked about my “borrowing” the movie. Before he let me hang myself he pushed an envelope full of single dollars across the desk which were the proceeds from the night before. By taking that one opportunity, I was no longer a projectionist; I was a promoted to manager of the movie project, which expanded to not only Immaculata, but to Rosemont, Bryn Mawr, and Harcum colleges as well. And that’s how I was able to buy really cool Marantz stereo system (which I still own). I was 21, a Villanova graduate, immediately employed, and still in shape. I moved to Boston and continued training and racing while working with Boston Marathon champion Eamonn O’Reilly who coached me to my first of many sub 4:00 miles. As a post-graduate athlete, the meet promoters (mostly indoor meets) matched me up against Villanova undergraduates. Obviously the most remembered was when Don Paige and I raced in Madison Square Garden over 1,000 yards. For three laps we jogged behind the field, in one lap we strode to the front and then we ran a two lap kick and brought most of the Garden to their feet. To this day I wish the race was 1010 yards . Don set a new world record and we had a pair of full page pictures in Sports Illustrated. Bottom line, after all is said and done, the most proud moments I remember were running on relay teams and setting Villanova records. 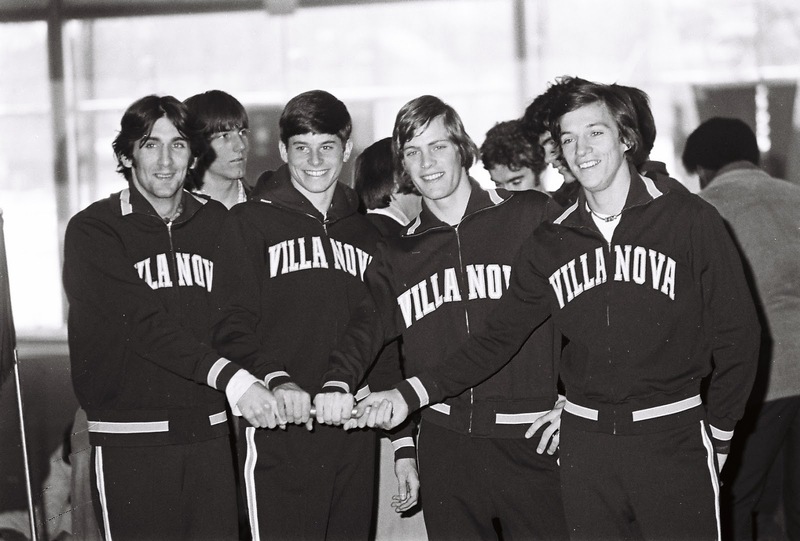 In several cases the Villanova Record was faster than the world record, but since we typically had a foreigner on the team (Canadian or Irish), the record could not count as a world record… which was pretty cool. A recent 2009 interview with Mark is available HERE. In 1972, Dale Scott set a high record for 880 yards of 1:48.5. Belger did not approach this time in high school. Specifically, what US high school record are you referring to? Hi, thanks for your comment -- I need to verify that statement -- the claim appears on the Wikipedia page for Belger listed here: http://en.wikipedia.org/wiki/Mark_Belger but as I read the source that the Wiki page refers to (linked at the bottom of the original post here), the language there is rather vague. Pending . . . .
Update -- the page linked below states that the US prep record for 880 yards belongs to Richard Joyce, who ran 1:48.8 on June 5, 1965 at the California State meet in Bakersfield, CA. Either way (Dale Scott or Richard Joyce), it seems not to be Mark Belger, so I'll edit. Thanks.